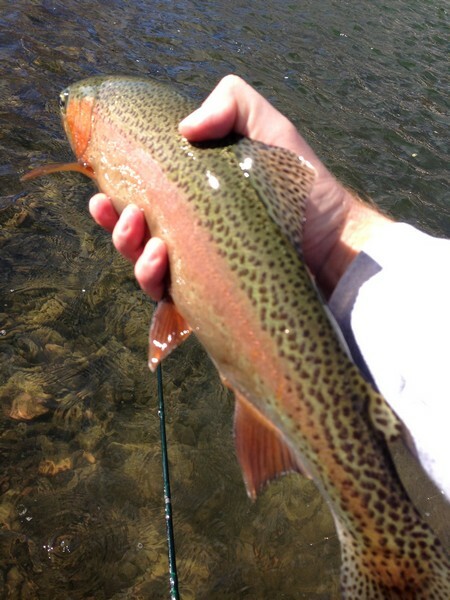 The fishing on the Arkansas below Pueblo has been fantastic this winter. Although the river is crowded on weekends (and even some weekdays), there are fish to be had for everyone. Fishing on this desert tailwater in the winter requires a change of tactics, especially at low flows. Lower water translates to limited holding water for trout. The flows this winter have ranged from 30-80cfs, although anything in this range will fish very similar. Adjust your tactics for these lower flows – try smaller indicators like yarn, Palsa, or small size Thingamabobbers. Downsize your tippet to 5x and 6x, and make sure that you are using painted split shot (we like the Dinsmore lead-free because it is painted green). Use a stealthy approach when you are approaching a run..most of the runs on the river won’t even require you to step into the river, so when in doubt – stay on the bank. Nymphing is the name of the game right now, but on warmer days there has been some intermittent dry fly action – mostly on very small midges (24-28). The obvious runs on the river still exist – fishing behind structure and in slower moving water has been productive this winter. 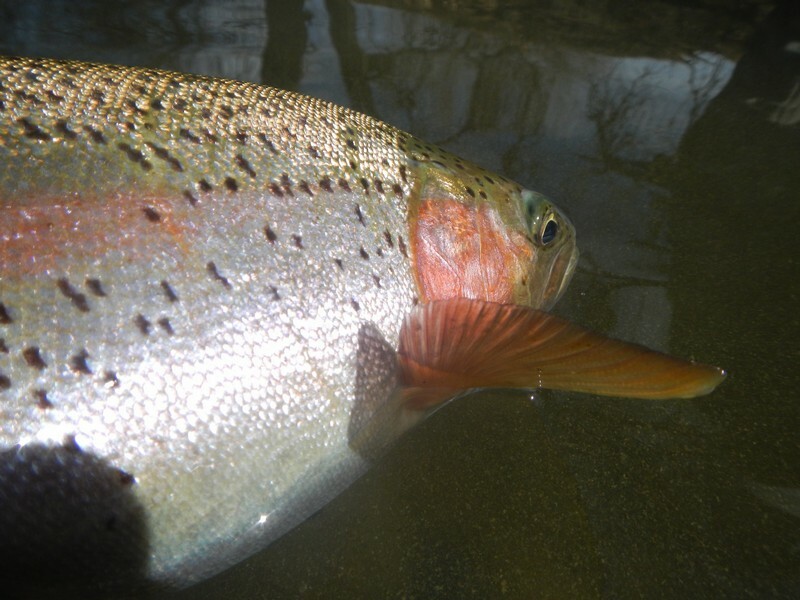 It is critical to get a drag free drift this time of year, as most fish aren’t willing to move a to eat flies. Make sure to change the depth of your rig as well as the amount of weight that you are using in order to get our flies into the right zone – low and slow has been the name of the game, as is the case for most winter fishing. Fly choice on the Arkansas during the winter is not as critical as making sure that your rig is set up correctly. This means changing weight and depth often, as mentioned before. 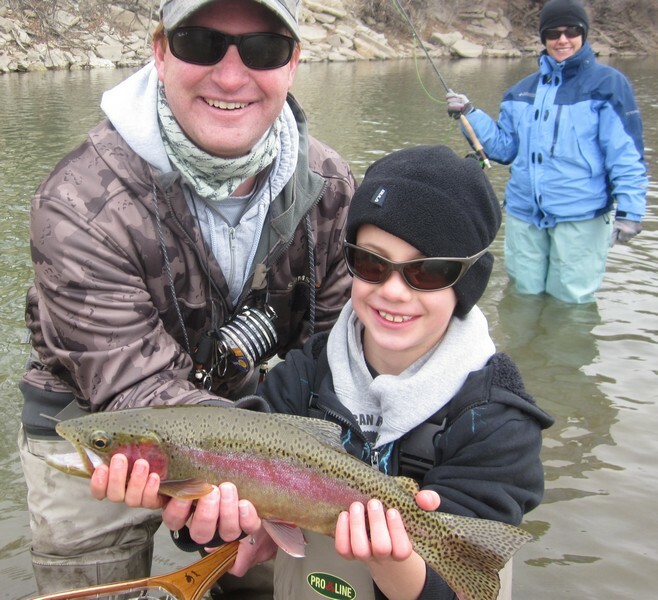 Arkansas River fishing these days entails lead flies such as San Juan Worms, McFly Foam Eggs, Scuds, and Troutbeads will take fish. Trailer flies include Jujubaetis, Zebra Midges, Blood Midges, small Pheasant Tails, and Black Beauties will take fish throughout the day as well. New patterns that we have had great success with has been Frank Smethurst’s new Bomb Midge and Voodoo Midge. The Bomb Midge is tied with a heavy tungsten bead and really looks buggy without being too flashy for those picky fish who have been over-pressured recently. Frank’s Voodoo Midge is also a buggy pattern, and the movement on this fly is unreal once it’s in the water. Using sparse flash on the Voodoo, Frank was able to create a pattern that will catch even the pickiest fish. We just got these in the shop and they have been flying out of the bins – come check them out! 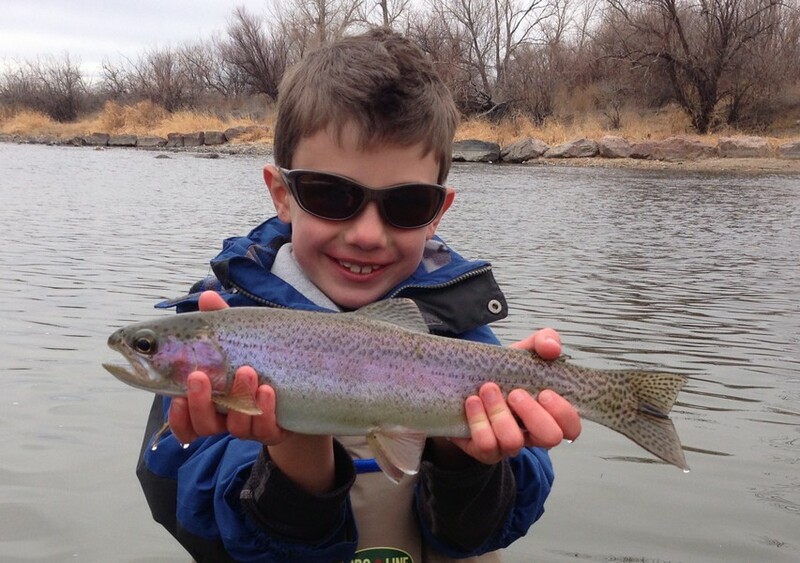 Arkansas River fishing below Pueblo will only get better as the flows and temperatures rise. Mid-March into April will bring the emergence of BWO’s, and the dry fly fishing, especially on cloudy days can be phenomenal. This will also allow you to fish some larger nymphs like Barr’s Emerger, BH Pheasant Tails, Micro Mayfly, and Soft Hackles. Keep your eyes peeled for these bugs and rising fish, and bring your dry fly rod and a spool of 6x! The nymph fishing will also continue to improve as water temperatures rise and fish become more active. Keep an eye out for bulldozers in the river as more stream improvements have started. While it might be a burden right now, the results from these improvements will make the fishing better for everyone. Get out there and go fishing!